Should Idle No More Include African Canadians? 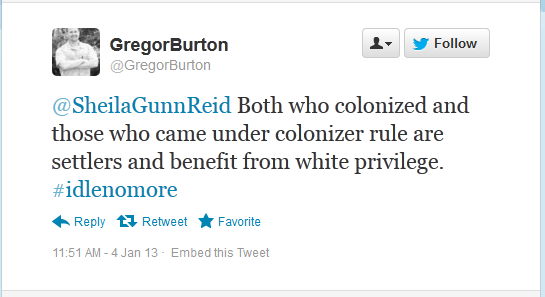 There is a small but vocal fringe in the Idle No More movement which advocates for the deportation of said "settlers". This unfortunate sentiment has turned potential friends into foes -- especially in the black community where it's a chilling reminder of the first time Africans were forced to traverse the Middle Passage. The similarities between aboriginals and black Canadians abound: both were oppressed people, both were driven/captured from their homelands by mostly Europeans. Both were dehumanized and denigrated as wild, suspicious and uncivilized. In the wake of the Idle No More movement, Canadians of all stripes have taken sides. Some denigrate aboriginals for falling prey to centuries of oppression while others feel it is time to address chronic issues once and for all. Others have simply dismissed it as yet another "Indian thing". Canadians of African descent tend to feel sympathy for indigenous peoples. The similarities between aboriginals and black Canadians abound: both were oppressed people, both were driven/captured from their homelands by mostly Europeans. Both were dehumanized and denigrated as wild, suspicious and uncivilized. Both have suffered overt bigotry, denial of rights and opportunities during the colonial period. Enduring prejudice, profiling and over-incarceration round out the similarities. From the very beginning, there is said to have been regular intermingling between Native Americans and Africans, which might explain why a polyglot African man, Mathieu Dacosta, was called upon to interpret and translate Mikmaq language on explorer Samuel De Champlain's maiden voyage in 1604. Today, there are large numbers of blacks in the Americas who share Native ancestry. It was the same Europeans who forced indigenous people onto reserves that introduced slavery. In fact, for most black Canadians, the historical trajectory of their presence in the Americas begins with the transatlantic slave trade. Unlike natives, there are no apologies, no reparations, no special recognition for the centuries of torture brought upon 12 million people. The peculiar institution erased language, religion, culture, and any lands previously associated with its victims. Even their names were forcibly replaced with Eurocentric monikers. Yet blacks still identify with the plight of indigenous people. In an interesting evidence of relations between Indians and African Americans, as it were, is found in the account given by escaped slave Josiah Henson of his flight in 1830 with his wife and family, through Ohio into Upper Canada. The fugitives were kindly received and entertained in an Indian camp. Henson would go on to establish the Dawn Settlement in Upper Canada "for the alone purpose . . . of Education Mental Moral and physical of the Coloured inhabitants of Canada not excluding white persons and Indians"; commemorated today at Uncle Tom's Cabin Historic Site in Dresden, Ontario. In the West coast, the Father of British Columbia, a black immigrant named Sir James Douglas, took a wife of Cree ancestry in 1828, forging an alliance in accordance with customs of the epoch. While our history books feed the Euro-centric narrative of constructs such as Savage vs. Civilized, Indian vs. Conqueror, or Black Slave vs. his Master, the full spectrum of these relationships begs to be rediscovered. 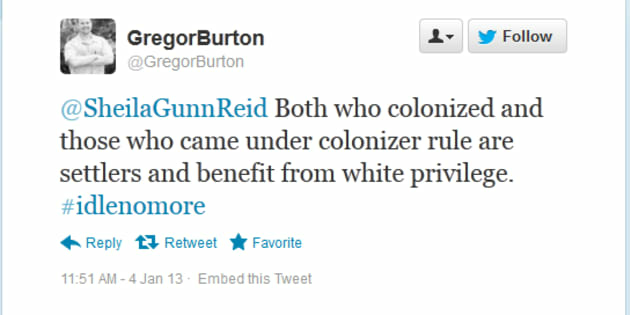 As #IdleNoMore started on Twitter, the medium continues to be a focal point for the movement. The Twitter thread is peppered with references to legendary activist Rosa Parks, who refused to give up her seat in a segregated bus, quotes from Dr. Martin Luther King, Jr., a central figure in the quest for African-Americans' civil rights in the 1960s, and excepts from Bob Marley's defiant anthems. Perhaps there is room for a renewed kinship there. Unfortunately, the thread also refers to non-indigenous Canadians as "settlers", in an "us VS them" ideology which is a disservice to the movement. Rosa Parks wanted to sit alongside her fellow citizens, to erase the racial divisions of the day. Martin Luther King's unifying message resonated with people of all races and creeds, and drew allies far beyond the African-American community. Martin Luther King took the high road at every opportunity, refusing to mirror the toxicity thrown in his path. The term "settler" promises to puncture the circle of tolerance, inclusiveness and fairness which endows aboriginal culture -- an ethos which forms the cultural inheritance upon which Canadian memes are intricately seeped. There is a small but vocal fringe in the Idle No More movement which advocates for the deportation of said "settlers". This unfortunate sentiment has turned potential friends into foes -- especially in the black community where it's a chilling reminder of the first time Africans were forced to traverse the Middle Passage. Somewhere along the line, some have forgotten that protection of waterways is of concern to every living person, that all Canadians fancy a long-term solution to the chronic problems highlighted by Chief Spence, and that respect is a two-way street. While the African and aboriginal ancestral drums differ in dimension, they may strike matching rhythms. The ties that bind needn't be eradicated; formed under duress, they can be forged anew. Here's to the powwow that makes room around the circle for everyone, where all can feel welcome alongside Canada's aboriginals.